Bolla is a historic wine-producing reality that, for 125 years, has been producing quality wines in Valpolicella. Two wineries: one in Soave, dedicated to the production of white wines and more to Pedemonte, the real red soul of the company; an oenological colossus with a production of nearly 15 million bottles a year and all of which embrace the wines of Soave and Valpolicella. 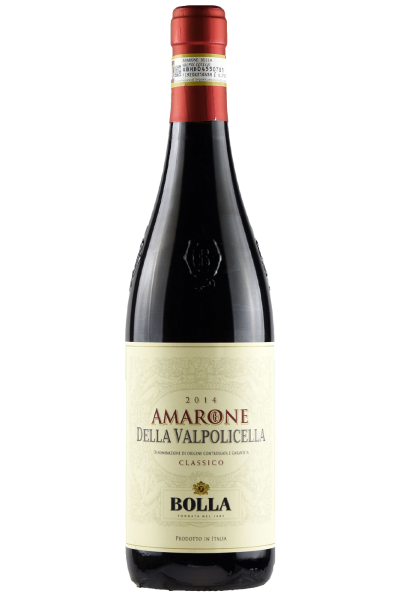 From a careful selection of Corvina, Corvinone and Rondinella grapes, harvested and left to wither and then vinified in full respect of local traditions, Amarone della Valpolicella Classico Lo Storico is born: a wine of great balance and refinement, austere and powerful and, at the same time, soft and pleasant. Intense ruby in colour, it opens a sensation of morello cherry, plum and black pepper, vegetable of undergrowth, chocolate, tobacco and rhubarb. Powerful tasting, warm and very soft, with vigorous but well-balanced tannins and long balsamic finish. With wild game in salmì, with braised beef and great aged cheeses. High quality with the price between 20-30 euros.